Many people are trying to process the untimely death – the suicide – of Robin Williams. He is a legendary comedian and actor who I first knew as “Mork from Ork.” California law required a detailed release of how he died. Depression. Hanging. An as of then publicly undisclosed diagnosis of Parkinson’s disease. Husband. Father. Friend. Loved. I’m not sure it gets any easier with time or that questions are ever answered. I find I’m still in some stage of grieving the suicide of a childhood friend who took his own life just over three years ago. Steve, Steven, or Stevie. Few were allowed to call him Stevie. I did. Our moms were best friends before we were born. I’m a few months older. His father was absent and therefore was raised only by his mom. Today I would say he was co-parented by my mom and dad. There were always behavioral issues. As children, mom kept a watch over me for his flying toys – hurled without warning. I recall hurling my own plastic bowling pins at him for something. We laughed about it years later. He was diagnosed as ADHD and was on Ritalin for most of his school years. He could be off the wall and very funny. Hyper-creative at times. His own Mork from Ork impersonations guaranteed a “nanu nanu” and a “shazbot” now and again. On and off, he and his mom attended the same church with my family. He participated in Youth Group at church. Sometimes there were emotional outbursts with other kids and adult leaders. In the church parking lot, my parents thought once he tried to run me down with his car. On occasion he would drive circles around the block around my house. In later years, he always offered his opinion on anyone me or my sister dated – or married. He worked for some time in the Renaissance Festival circuit. But, he was mostly unemployed and on disability. Issues with authority figures. You never new what to expect. Confrontational at home throughout his life. Occasional threats to end his life. He threw himself into working for the local historical society. One of my last memories is of helping him with an exhibit. The historical society came into possession of a few Gone With the Wind items of historical significance. Stevie called to ask if I would mind loaning some of my collection to fill out the exhibit for a weekend. Realizing I’d become detached from owning this collection, I quickly agreed to help him. I packed up some items and left them with him for a couple weeks. I attended the exhibit. It was very nice. Mom called me at work one afternoon – “We have a problem. Stevie’s gone. He’s dead.” – she whispered the last two words. He had gone to the historical society alone with a researched plan. Plastic wrap and nitrous oxide. He didn’t come home when expected and another historical society member found him – seated on a sofa – gone. He had recently turned 45 years old. I remember scouring Facebook for his last posts and trying to remember our last interactions. I was thankful for the GWTW exhibit collaboration. His mother wanted my sister and I to speak at the grave side service. I remember looking out at people – relatives – many of whom had their own troublesome history with him. I wasn’t always kind to him. I was even hateful at times. I said I would miss him and I cried. I looked at his mom and I meant it – the words and the tears. 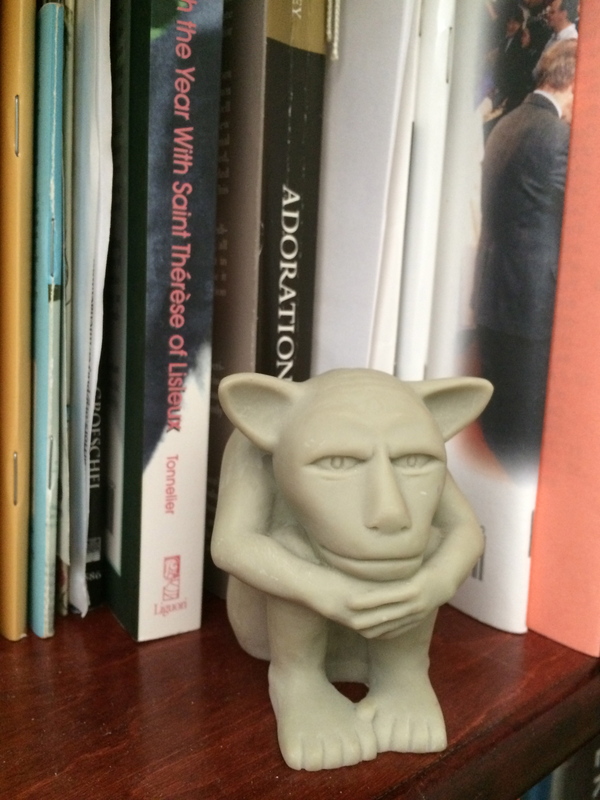 The last Christmas present I remember getting from him is “The Dedo” – a small replica of a sweet faced gargoyle from the top of Notre Dame Cathedral in Paris. Legend has it that it was carved by the nun “Marie Therese” from Provence. She didn’t like the evil faced gargoyles and carved this one instead. She slipped into the Cathedral and placed on the highest point “closest to God.” The Little Way of love. Shortly after Stevie’s death, my parents, sister and I went to visit with his mom. It was my job to look around the house and the computer to see if there was anything left behind – perhaps a note. I slowly walked through the house. All the places he spent most of his time. The attic where he retreated to smoke. The computer desk. His room in disarray. Relics of the troubled spirit. As I looked around the house and the shelves, there among his collections was another Dedo – exactly like the one he’d given me. I picked it up and held it for a few moments. I left it there. This entry was posted in My Life, Personal Reflections & Poetry, Random Thoughts and tagged Anxiety, death, Depression, Grief, Robin Williams, Suffering, Suicide. Bookmark the permalink.